A PC based logic analyzer, SLA2100 CDLogic, is a full featured high-performance tool with 36 channels and 100 MHz sampling frequency support for the troubleshooting and performance verification of digital circuits. The CDLogic is controlled with software that communicates via USB interface for capturing wide range of data simultaneously. It has multiple probes and it can capture and display digital signals at 3.3V voltage levels in bit, byte and word format. The CDLogic software supports windows. This allows for more organized data display (with color coded data and increased screen size), intuitive user interface, and data management (file saving, loading, printing). The captured data is displayed in Waveform, List and Plug-in views. 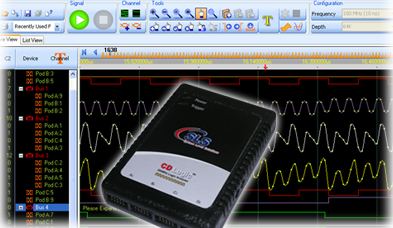 Explore the CDLogic software features by downloading the CDLogic software from SLS Downloads.